Our dinner pizza buffet includes gourmet pizzas, pasta, breadsticks, homemade soup, garden fresh salad bar, and featuring our chicken wing buffet! Take 1/2 off any appetizers, excludes combo. Available Monday to Friday, 11am to 2pm, for Take Out only. Dinner for Two includes one 13" Pizza with two toppings, Soup and Salad Bar (2), Breadstix, and one 7" Fruit Pizza. 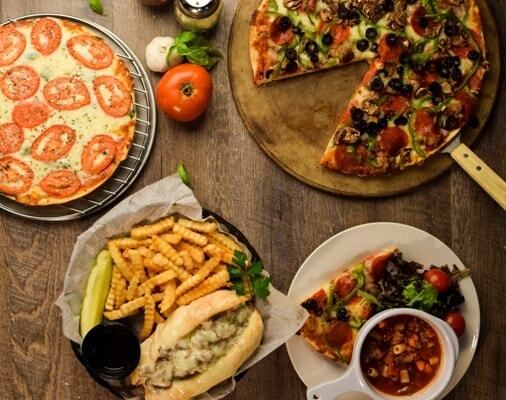 Dinner for Four includes one 16" Pizza with two toppings, Soup and Salad Bar (4), Breadstix, and choice of Cinnamon Sticks or 7" Dessert Pizza. All specials are Dine-In only unless otherwise noted. We do not provide to-go containers for our soup, salad bar, or other food from the buffet. All specials subject to change without notice. Specials cannot be combined with any other offer.